This is one of those recipes that has just never appealed to me. It sounds sweet and sickly, and if I ever saw it on a restaurant menu, it’s certainly not something I’d order. But, I have an awful lot of egg whites left over from yesterday’s Peach Melba, so here goes. The recipe starts “First make the ice cream”, at which I feel smug. It’s the same ice cream recipe that I made yesterday, and there’s still a huge amount left in the freezer. I can skip this and move on to the meringues. I’ve made meringues a few times just lately, so I’m pretty confident I can pull these off without too much trouble. 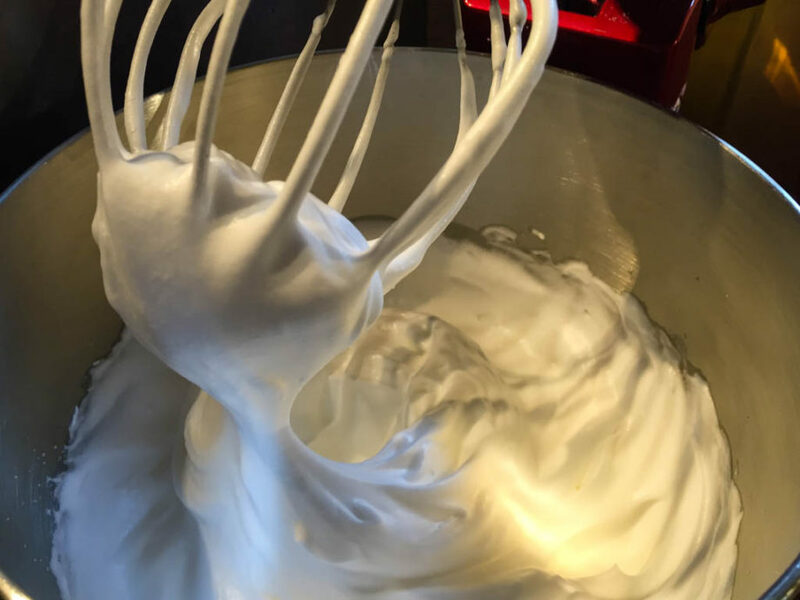 I beat egg whites with a little salt until stiff, then beat in some of the sugar until glossy and stiff. Next, I fold in the rest of the sugar until it’s all mixed thoroughly. Now to prepare a baking tray. 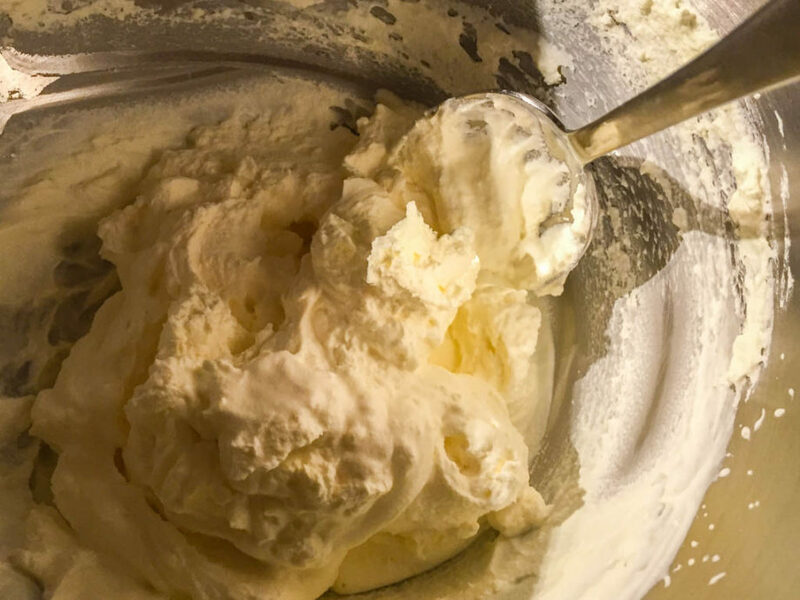 Hopkinson and Bareham try hard to put the argument that rubbing a baking sheet with butter, dusting it with flour, then pouring off the excess flour into the sink, is a far superior method than simply cutting a piece of baking parchment to size. Sorry, I don’t buy it. I use baking parchment extensively. I use it for everything, from making biscuits to roasting potatoes. It’s an amazing product, and a staple in my kitchen. I have no intention of accidentally dusting half the kitchen in flour just to stop some meringues sticking, so I cut some baking parchment to line my baking tray. Next, I spoon the meringue on to the parchment. The recipe offers a lot of leeway here in terms of how you do this – you can pipe it, or spoon it, “in whichever form suits your mood.” I opt for the more rustic look, with peaks and ragged edges, rather than perfectly smooth rounds. 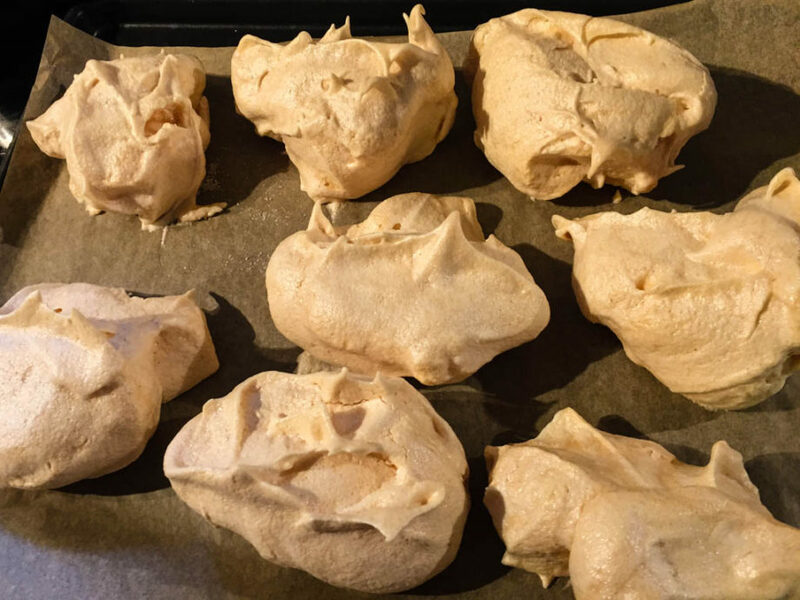 The meringues go into the oven for about an hour and a half, and are a pale coffee colour when they come out. Whilst they cool, I make the chocolate sauce. 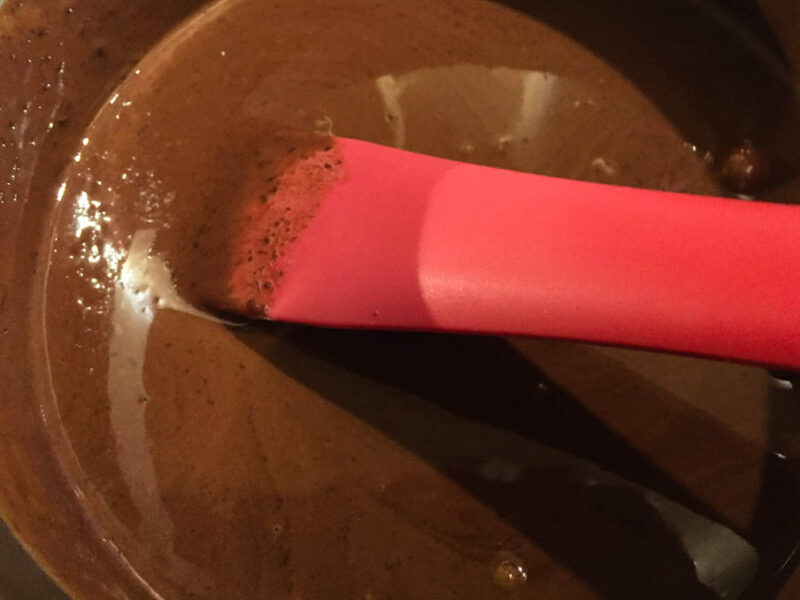 Very simple – just dark chocolate and cream warmed together in a pan, and then some butter whisked in to it. Lastly, I whip up some double cream, together with some caster sugar, until thick. To serve, I take two meringues, put a scoop of ice cream onto a plate and sandwich it with the meringues. A dollop of cream goes on top of the ice cream, and chocolate sauce is drizzled over the top. Now, I realise as I’m doing this, that my meringues are probably a little on the large side. 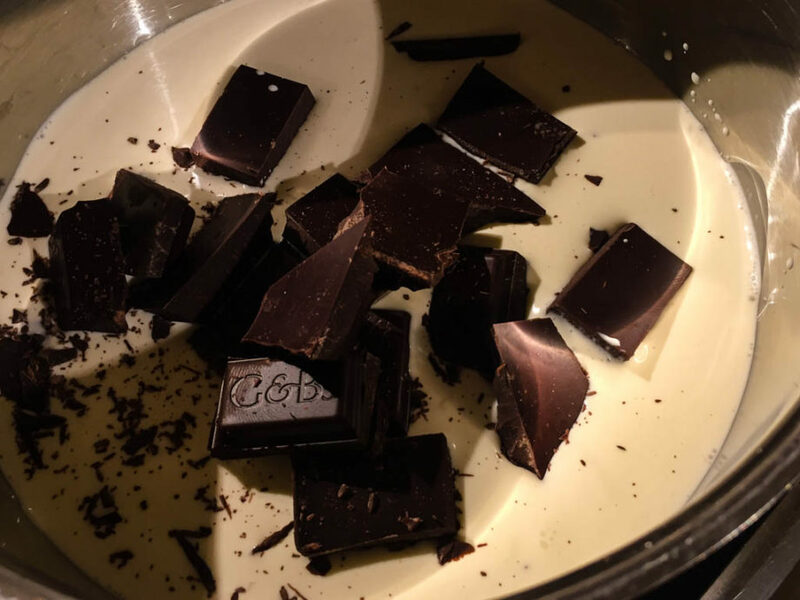 Maybe I should have made them a little smaller – this is turning into a huge dessert. Oh well. Let’s see how it tastes. It turns out to be rather nice. Nowhere near as sweet or sickly as I feared. The meringues have just right amount of sweetness, and this is tempered by the richness of the dark chocolate sauce. 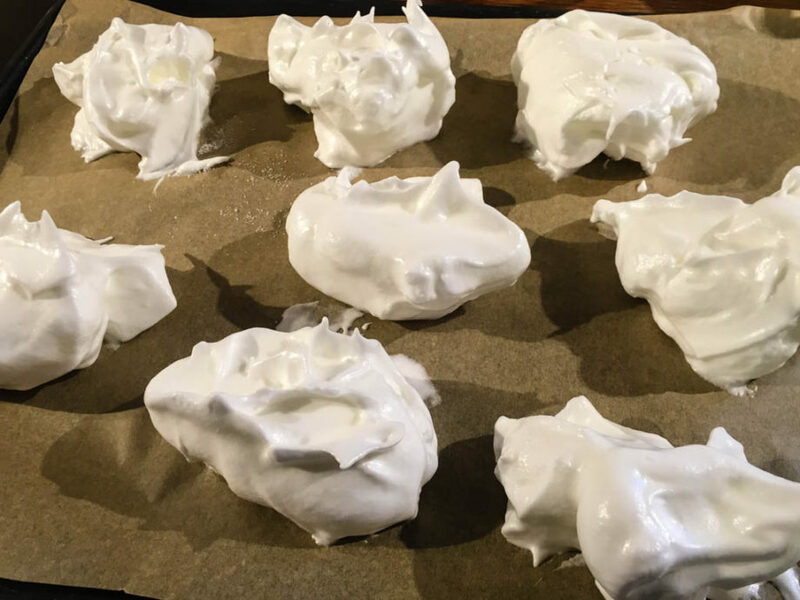 The meringues have just the right texture – crisp, and firm to the touch, but readily crumble away to reveal the beautifully sticky interior. I have to say I enjoyed it. It was way too big though. Another blinder on the dessert front from Dave. His meringues have really come on well in recent times. These were not too sweet. They were delicate and crisp on the outside and sticky and chewy on the inside. Just on their own these would have been really nice. 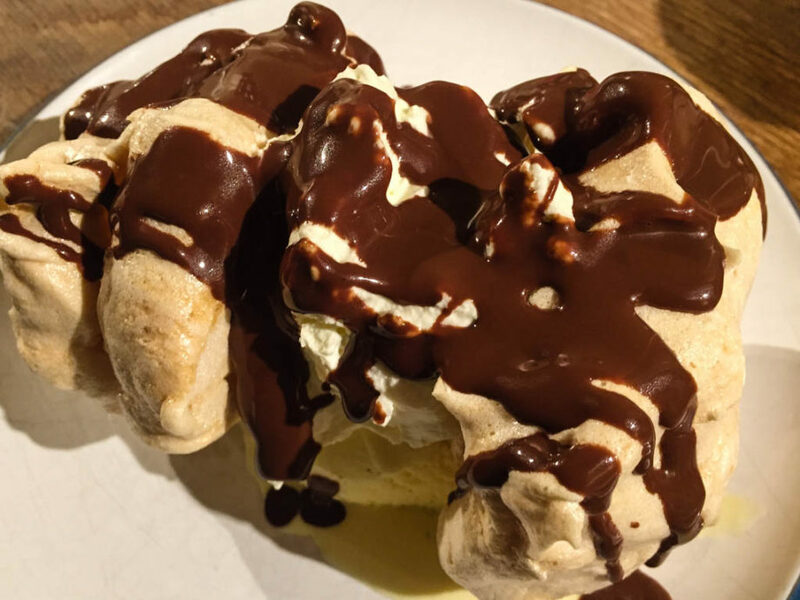 But then he made a chocolate sauce which was really chocolatey and to top that off he heaped whipped cream and vanilla ice-cream in between the meringues. It was a plateful of fluffy clouds with chocolate sauce on. Very nice. Certainly dinner party standard, but they could have done with being a bit smaller.